Because I started blogging, a significant number of opportunities came my way. One of the most significant was my relationship with Bohemian Caverns, and the ownership team of Omrao Brown, Sashi Brown, and Jamal Starr, who all became family for me. In particular, Omrao Brown became one of my closest friends and a de factor older brother. How I got there is a fun story in and of itself and a lesson for all those folks who write and wonder who is reading and if it makes any difference. One day, a friend of mine – this has to be back in 2005 – asked me to host an arts event she was putting together at Eastern Market in DC. I happily obliged and one of the people she had there was Russ Brown who had a website (www.stockholm180.com, me thinks). Anyway, he and I never talked that night but I looked over his site and felt like I should add it to my blogroll on my old stomping grounds, jacksongtickle.com. One day, many moons later, and randomly to boot, Russ emailed me telling me that he saw I linked to his site and it brought him a good amount of traffic so he checked out my site and loved what he read and wanted to do business somehow. At this point, he had no idea how and I didn’t really know him, but hey, business is business. Eventually, he created an open mic + afterparty concept called Stock13 Open Mic, and its home was Bohemian Caverns. This had to be sometime in May or June 2006, I believe. I don’t remember how long this open mic lasted, but I’m guessing somewhere to at least October or November. Well one day Russ called me and asked me if I’d be interested in working at Bohemian Caverns. Apparently Omrao, who I’d met while hosting but really didn’t know at all asked Russ to come thru to help him manage but Russ was too busy trying to take over the world or something so apparently he suggested me to Omrao. While we were doing the Stock 13 events, I took it upon myself to be as responsible as possible with it all and Russ took notice and felt like if O needed somebody he could depend on, I might be a good fit. Russ put me in touch with Omrao and in February of 2007, I showed up for my first day of work. To say that Omrao had no idea how to use me would be an understatement. So I just kept showing up. I did what I thought I was supposed to do. I helped out here and there. If it needed doing, I learned how to do it. Working at a nightclub had long been on my bucket list of things I’d wanted to do (at the time of my “hiring”, I’d just finished up a two-week bartending course hoping to catch a bartending job somewhere else, but skipped that line into management). Over time I settled in as an operations manager of sorts at Liv. I ensured we opened doors on time (this was a big deal for me; I HATED opening even five minutes late), did whatever was necessary to keep the night moving, and got us all closed up at the end of the night. Ultimately, my goal was to make sure that Omrao, and the general manager, Derrick (one of the most indispensable hires of all time), could leave the building and all would be safe. And that’s what I did. Over the next few years, I showed up, mad sure the parties in Liv succeeded as much as I could and made a ton of friends. I stopped working there on a “full time” basis a week before my daughter was born in 2009, but continued to work there whenever needed and then instead of working, I started doing events there. I started throwing a 90s party called Reminisce and then a southern party called GRILLZ (the final one at LIV is tomorrow night), then when I got Lit. District started, I naturally chose Tap & Parlour, on the steet level of Bohemian Caverns. It was the site of VSB’s Three Year Anniversary Party, #threedeez, and the location of the baby shower for my daughter. Bohemian Caverns has been home for me for the past 10 years. It’s been such an integral part of my life that, true to expectations, when it was finally made public that it was closing via an article in the Washington City Paper, my phone lit up with questions, concerns, and prayers as if I was one of the owners. It will be bittersweet when it closes its doors for the final time. Having a home away from home is great, especially in the nightlife scene. I’ve made so many permanent friends because of Bohemian Caverns; from the security detail, to promoters, to bartenders, to the cleaning staff. These are people I have spent time with at their homes and invited them into mine. We’ve talked for ours on end about life and relationships and problems, etc. And of all the people I’ve had the significant fortune to meet, Omrao Brown has been the most significant. Talk about somebody becoming family. One of the best things about working at a night club and doing the types of events we did, was that they all lend themselves to music convos. And having a club owner who is also a hip-hop head helps. We’ve had some vainglorious debates and conversations on evenings before the club opened. But those debates – had with pretty much anybody in earshot, there’s actually one promoter who I nearly HATE to this day because of something she said in one of those debates, I’ll spare her name – led to realizing who you have stuff in common with. And Omrao and I clicked. For one, I’m a doer, so I didn’t do much in the way of dilly dallying when it comes to work. If something needed to be done, I was about that life. It’s easy to like people when they actually HELP make your vision come to life and keep business moving smoothly, and if there’s one thing I learned about the nightlife its this: it REALLY is hard to find good help. Good God, man. For legal reasons, I’ll leave that one alone. Over time, Omrao became a big brother to me. We talked about life and my relationships, and his relationships. And his family, and my family. I me this family and he met mine. His girlfriend back then would come over to my house to hang with my family on occasion and to see my daughter. It was a friendship beyond the job and I appreciate him for that. Sometimes in life you luck up and find real friends and you cannot take that for granted. So while Bohemian Caverns is closing, I’ve got a friend for life that I can call, text, and continue both real and asinine conversations with. DC on the other hand? Listen to me: the loss of Omrao on U Street is a significant one. 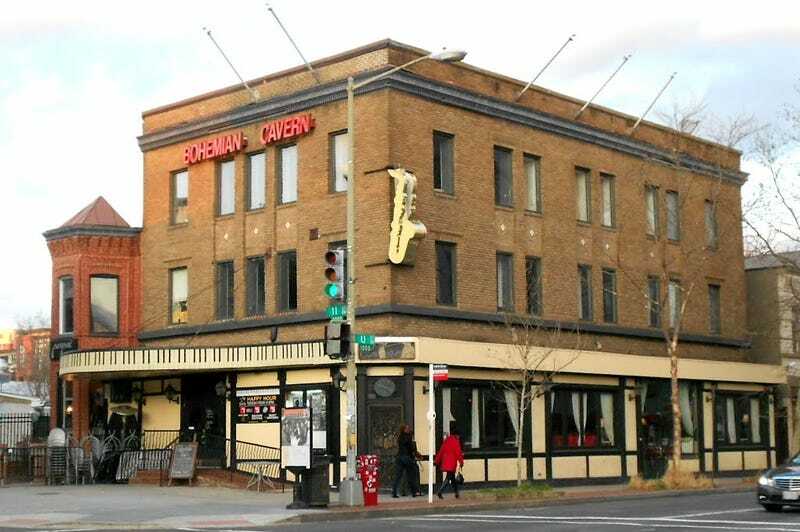 We’ve had every imaginable type of event at the Bohemian Caverns Complex (including now Tap& Parlour, the restaurant on the main level, and Liv, the nightclub upstairs). I couldn’t even name every artists that’s performed there if I wanted to, but that list DOES include: Ron Carter, Pharaoh Sanders, Roy Ayers, BBD, Mobb Deep, Emily King, J*Davey, PacDiv, Res, Mark de Clive Lowe, ?uestlove, Erykah Badu, 9th Wonder, The Roots, Snarky Puppy, Little Dragon, Grethen Parlato, Elle Varner, Teedra Moses, Q-Tip, Pete Rock, Wale, etc. The jazz scene is losing one of the most well-regarded jazz clubs in America (though to be fair, there are other well regarded clubs in DC like Blues Alley in Georgetown) and an owner in Omrao who was insistent on allowing local talent to flourish. And don’t even get me started on the club upstairs. Look, I worked in that club for two-years straight though. I can’t TELL you how many promoters owe money. There were so many nights where a bar guarantee wasn’t met and O let them slide. There were so many different types of events that happened (and things I can’t ever unsee); Bohemian Caverns became a spot for alternative entertainment for the cool kids. You wanted to see a dope show from an up-and-coming dope artist that hasn’t broken nationally? BC just might be your spot. Or an artist you loved who was on a tour after their heyday? Again. I’ve met so many celebrities at Liv that the idea of a celebrity isn’t even exciting anymore. And Omrao fostered that type of environment where anybody could come in there and chill and be at home. It was comfortable for so many of us that we’d show up there on days we weren’t working. And that doesn’t happen without an owner who understands people. As a person who has worked “on the scene” for a great many years, the closing of BC will leave a huge void. The open-mics and 90s parties and 80s parties and dance and funk parties and mostly the jazz will all have to find new homes, and to be frank, some already have. Keeping personal relationships in tact sometimes requires letting a business relationship go. But that doesn’t change how many parties and people got a start at Bohemian Caverns during the Omrao Brown era of ownership. I can’t stress enough how much I’ll miss starting my nights at 11th and U Street, NW, even if I only walked in for a solid 5 minutes. Sometimes I’d walk in the building and dap up a bartender and a barback and then mosey on down to whatever spot I was going to on U Street. On nights when I had absolutely no idea where to go but I know I needed to go somewhere, I’d start at BC and see where the night led me, and oh did it lead me in odd directions at times. I’m ten years older than I was in 2006, and thus my life looks a lot different. I’ve got children and VSB didn’t even exist in 2006. I don’t spend nearly as much time out as I used to and that’s okay. And I’d wager that many folks are similar. But the idea of a place you view as a home not being there even while you’re at home is a hard pill to swallow. I’ll miss BC for the memories, the friendships that persist to this day, and all of the good times I’ve had in that building. While the memories are mine and the friendships aren’t really going anywhere, having a common meeting space like BC was just part of life. I guess life goes on…luckily I get to take most of what I got from BC with me. To Omrao and Bohemian Caverns, thanks for the good times. What you did there won’t be forgotten and you will be missed. For me, a significant part of my time and life in DC, a place where I really came into my cool, is closing its doors. But the memories will live on, and I think I can live on those. I guess I don’t really have a choice.